Maybe, Treehorn, they don’t read enough. Give yourself an hour or two. Just sit down with a notebook and pen and read the four articles below very carefully, huh? They have special messages. Take your time. Think about the issues. 1. “Why did I leave my child at a test-focussed school as long as I did?” Jolisa Gracewood seems to ask. She was a very involved, very school-committed parent who worried about the influence of a testing culture on her child’s attitude to learning. This story is for those parents who let such worries last too long. 2. Are you sick of hearing about Finland being the end-all of purposeful schooling? Yes? I reckon, too, that Australia can do better, following similar beliefs of course, better done. We also have the personnel. Check out these beliefs however before you start writing to your local member. Finland is so very, very learning oriented. Here are two on-the-spot reports of what they do, written by some experienced folk. This first one is lengthy – 5 pages. Hang in there. The detail is important. The second one, from Samuel E Abrams wraps things up succinctly – 2 pages. Read both and plan a schooling system for Australia that works better. I’ll wager that your first suggestion will be to dispense with Naplan. Finns would. 3. CURRICULUM Leadership in schools is essential. In most countries, especially Australia, existing quality leadership can be diverted from the ‘curriculum’ component in the face of other imposed demands. Sage Kelvin Smythe, former Chief Inspector of Schools for New Zealand, writes of its importance; and compares it with managerial leadership fostered by our super-clueless administrative theorists a couple of decades ago; and we have been saddled with it’s ridiculousness ever since. Plumbers have been running the garage and square pegs fitted into round holes in too many instances. “In a way, curriculum-driven leadership is everything that managerial leadership isn’t :- home-grown, holistic, broad-based, curriculum derived and concentrated, teacher informed, practical, aim and essence based, being-there evaluation, democratic, interrogative, and an art.” says Kelvin. Enjoy the reading and the note taking. Thanks to Allan Alach & Kelvin Smythe for sharing. Please tell everyone about what you have just read. Don’t forget your local member. There could be a party meeting soon. Treehorn is not feeling well. He was immortalised by Florence Parry Heidi in The Shrinking of Treehorn but it doesn’t seem to have done him or his school friends any good. Nobody with any clout cares about them. No groups of parents; no groups of teachers; no party of politicians…just nobody at all. Well, it’s not obvious. Adults keep talking about things like carbon tax, illegal migrants, naughty parliamentarians, football finals …evanescent topics by comparison with the learning welfare of kids at school….the crazy inequalities… the country’s future….schooling and learning. You would think that teachers had enough organisational ability and political acumen to make ‘TESTING’ the Number One issue for the forthcoming elections, wouldn’t you? Don’t lose hope, Treehorn. Something will happen. When Naplan testing is stopped; is dead, ‘buried and cremated’… you will be able to grow to 10 feet in height and turn purple, pink and maroon in celebration.You’ll love schooling then because it will be about learning and beauty and challenge and fair-dinkum self-activated achievement. Can you imagine, then, what our country will be capable of doing? In the Conclusion to his advocacy for a Rebel Maths curriculum, he says, “In this Rebel Education, gone are the days of Algebra, Geometry, More Algebra, Trigonometry and Calculus. Gone are the days of lengthy multiple choice tests. Teachers assess students by analysing the products they create and encourage the students themselves to reflect critically on their own creations. Students are not pressured to meet Imperial standards, but instead be responsible for setting their own goals for improvement each semester. The students don’t feel like they are competing to score higher than their classmates, but instead learn to recognise that each of their classmates has a different set of skills and that by cooperating they can achieve things that they could not do alone. While the Empire is pumping out clone after clone, the Rebels are producing a diverse array of students with varying sets of knowledge and skills. Might I refer back to two-Treehorns–ago about the beauty and challenges of Maths? Monday’s satellite photo of hurricane Irene showed Fibonacci’s discoveries pretty clearly, didn’t it? I wonder how many present-day pupils noticed that….or how many Kleinists would care. Just a point. What do you think a country could do, if it treated Mathematics as a thing of beauty and achievement and challenge – instead of trying to produce cookies all the same size and shape. A comment and story, printed in the Washington Post on Monday, [29-08-2011] has just arrived. Thank you Marion Brady. It is certainly relevant to the present discussion on the bastardisation of beautiful Mathematics; and on the government’s use of low-level methods of control of teachers – the reward and coercive powers- which only bring lower-level responses from the teaching force. Please share this with as many folk as possible…especially your local member, Naplan is dangerous. A Test for Your Own Point of View. Treehorn is a little primary school pupil, immortalised by Florence Parry Heidi in The Shrinking of Treehorn, whom adult carers preferred to ignore…just like all primary school children in this new “Age of Stupid’, as it has been described. Forced to go to factory-style schools [See Sir Ken Robinson below], primary school pupils just have to tolerate the controls, whims and dictates of test-publishers and their friends:- the new-age politicians, school-bare measurers and compliant schoolies. Like Treehorn, school pupils have no friends; at least none with enough clout to help them. Treehorn and his friends [we too] know that adults just don’t care much about little kids at school. This little share-it-all, bare-it-all occasional newsletter is dedicated to the unfortunate Treehorn and his fellow school pupils. This is a simple test for those who believe that primary and secondary school children need to be helped to develop their idiosyncratic and natural learning potential; and who think that pupils need to feel confident in extending their personal achievements to the nth degree without restrictions. If you believe this, you will agree with Sir Ken Robinson who describes what present-day schooling is all about. It takes about 12 minutes to view….many more minutes to think about. Some folk will have seen it already. It is a definitive presentation and pleads for absorption. Keep it as a favourite. If you subscribe to the tenets of the presentation, please tell others. Make sure that your local politician sees it. Like the rest of us, they have some learning to do.There is hope for Treehorn and other school children if you just do this little thing. It doesn’t hurt and could do mankind a great deal of good. If you wish to confirm your point-of-view, then have a look at what Yong Zhau has to say. When he says”NCLB or ‘No Chlld Left Behind’, substitute Naplan for Australia and ‘National Standards’ for NZ. When he says Arne Duncan, substitute Barry McGaw for Australia and Gillard for Obama. Simple. If you, in any way, support the Kleinist [fear driven] standardised blanket-testing regimes, such as Naplan, you will not enjoy the presentations. If you know of any presentation that shows that your blanket tests are of benefit to schooling, to children’s learning or to the welfare of the country, I should like to read it. It will need to be as definitive as that of Sir Ken’s, however, and show that the administration of such tests displays a love for children and their learning development. ….and is not used just to gather scores. I confess to being, unashamedly, on the same wave-length as these Sir Ken and Yong, together with others who are prepared to state their views publically and loudly about schooling and learning….folk like Allan Alach, Sir Robin Alexander, Peter Beatts, Marian Brady, Matt Damon, John Goodlad, Bruce Hammonds, Goldie Hawn, Douglas Hislop, David Hornsby, Alfie Kohn, Marian Lewis, Mary E Mackay, Susan Ohanian, Diane Ravitch, Kelvin Smythe, Valerie Strauss, Save Our Schools, Paul Thomson, Margaret Wu. There must be many many others [I’d like to learn of their work]. Few would wish to join with the Kleinists :-Gates, Gillard, Klein, Murdoch, Brendan Nelson willingly…would they?….surely not. Whoever does, must have other reasons. So the test is simple. Click on both sites and absorb the comment. If you agree, you are a LEARNER. If you support or approve of blanket testing [e.g.Naplan], you are a KLEINIST . Simple. Test yourself. *You may have heard on ABC Radio 612 on Sunday 28 August, 2011 [Yesterday] the Manager of the Milton Fish Markets in Brisbane tell interviewer Warren Boland that there is a noticeable increase in the sales of fish when schools hold their examinations. He said that many parents believe that a heavy intake of Omega3 clears the mind for tests. Ye Gods! Fair dinkum! *You may also have read where the unfortunate young lady, Madeleine Pulver, who had to wear a neck bomb for some hours, had to recover as soon as possible from the trauma so that she could prepare for another [even greater] trauma…her schools’ trial tests for the forthcoming HSC; the big one! Ye GODS! PLEASE SHARE THESE BLOGS WITH OTHERS. Treehorn, immortalised by author Florence Parry Heide and cartoonist Edward Gorey, and his school mates continue to be treated badly to satisfy…..
taciturn, confused, obedient teachers…..to apply fear-driven tests and a distorted curriculum to…. anxious children who do as they are told. You have probably seen this song sung before. Last year at this time…just before the US blanket testing of measureables …the clip featured a father singing the song to his drowsy son who was about to go to sleep; mentioning the things that he and his son would like learn more about :- Music, Art, Debating, Thinking….. that are put to one side. “They never teach anything not on the test” he sings. It sounds as if the lad’s school was a real test factory. Many are. Can’t blame them. Click on “Accurate, Though Sad, Music Video on Standardized Test” below and sing along. It’s a catchy tune. It’s Reading and Math: forget all the rest. Are not in the school ‘cos they’re not on the test. Someday you’ll learn to; but somedays’ not now. Go on to sleep now; you’ll need your rest. Please share with as many others as possible. Treehorn, immortalised by Florence Parry Heidi in The Shrinking of Treehorn, continues to be treated badly, together with his present-day school friends, to satisfy the greed of mega-rich test-publishers, the election prospects of compliant hench-pollies; and the ambitions of sycophantic, sciolist educators who provide immoral, destructive testing devices, through sad, unfortunate, obedient schoolies, to small children who also do as they are told. Treehorn understands the shape of what they do, but not why they do it. He’d like to learn properly, but nobody cares about him. Is it the End of the Beauty of Number? A recent email from a primary-principal friend was composed upon his return from a meeting with fellow principals where modifications were being suggested for the administration of the national blanket testing scheme [called ‘Naplan’ in Australia, ‘National Standards’ in N.Z, ‘National Testing’ in the U.K.; and ‘NCLB’ in the U.S.A.] for mathematics. He seemed so disappointed, sad and angry that his fellow principals were working on ways to dilute the poison instead of planning to throw it out. Stakeholders from academia trying to sanctify the measurement of ‘standards’ were there to lead the instruct/assess/analyse discussion ….and many principals co-operated. Amongst other things in his lengthy letter, he said, “I’m left with this uneasy feeling that this pattern of instruction/assessment does not have its roots in established learning theories and that it reflects some other kind of approach that is akin to the ‘standards movement’ with its origins in the economic supply side of education ideology. It sure doesn’t feel like anything I would consider examples of quality mathematics programs (carefully avoiding the jargon of ‘best practice’). I guess that I’ve developed my own feel and vision for mathematics over the 35+ years of my teaching career, and the things I heard today are clashing with this mindset. For the life of me, as a teacher who really enjoyed teaching mathematics, I can not see why in-depth ‘assessment’, and the like, is necessary for every area of mathematics. Exposing children to genuine real life [avoiding ‘authentic’ –ugh] opportunities to explore and use mathematics is much better. The source of my irritation is the relentless talk about assessment being necessary as a lead-in to learning. The phrase ‘assessment to learn’ is a good example. It is a very deficit-focussed model indeed, and the underlying philosophy is that ‘achievement’ [how I hate that word] is measured and ‘deficiencies’ corrected. I’ve started reading a book I ordered from Amazon “A Measure of Failure: The Political Origins of Standardised Testing” by Mark J Garrison. I’m only as far as chapter 3, but already it is crystal clear that ‘standards’ serves a political purpose, and in Garrison’s opinion, the idea is to prove that schools are “failing” so that, in turn, ‘reform’ can be justified. By passively going along with ‘standards’ at any level, we are agreeing to this by default. Why couldn’t we have entered the 21st century by treating Mathematics for what it is….a search for beauty and challenge through numbers and space; a journey of exploration; a conversation about the wonder of number; the fun of solving exciting and challenging problems; a chance to calculate; a chance to learn. Mathematics is, after all, the essential element of so many other things, especially art, music, space, architecture, almost everything. Maths is one of the most beautiful of things we do. Isn’t it sad that those civilisations that invented and developed base ten, because we had ten fingers, into the world of wonderment should go and invent papyrus as well; and ruin it all? I reckon that your Vancouver mate David Wees [ http://www.edutopia.org/blog/mathematics-real-world-curriculum-david-wees ] has the right idea pleading for the ‘real world’ to be at the centre of it all mathematics curricula. It must. surely!…Amen. Whoever invented the first written test of mathematics and its parts should be resurrected and charged with extreme cruelty and perverse destruction of social enjoyment. This doofus needs to be treated to very slow, excruciating, painful, special treatment. His legacy over the years has caused eras of enormous pain, stress and social destruction of children’s lives. which societies have had to wear as a consequence. There is so much joy and excitement in number that it needs to be shared even more widely than it is; not used as a disgusting kill-joy instrument. Ever wondered how Fibonacci must have felt to discover what he did ? He needs…as do other mathematicians of his ilk … to be venerated in the same way that great saints are. The history of maths, its heroes and the details of the discoveries is so remarkable, so exciting….so neglected. Moon landings and the like are almost non-events by comparison with such discoveries. What would we do to some-one who destroyed all the works of art in The Louvre, British, Guggenheim, Tate, Vatican, Smithsonian art galleries and museums ? Our test mongers are doing something far worse to a beautiful thing –mathematics. Disagree? * The Daily News printed an article suggesting that, following a maths test, half of the government members had been shown to be stupid. The government was incensed and called for a retraction. The Daily News willingly printed an apology and retraction, stating that half of the government members were not stupid. * The MySchool site, revealing the results of a Naplan maths test, showed that 5 out of 4 pupils had trouble with fractions. ‘The Treehorn Express” is sent to 131 friends and colleagues in the U.K., U.S.A., N.Z. and Australia. If you have a contact who might like to receive it, please send the email address to me. Please pass this message along to as many as possible. Give our Aussie children a fair go. Give them the freedom to learn. Treehorn still has problems. Nobody takes any notice of him and his primary school friends. All could have “NAPLAN VICTIM” tattued on their foreheads and few adults would worry about it….or even notice it. Treehorn learned this during his shrinking period as Florence Parry Heide and her illustrator, Edward Gorey, brought to our attention. Treehorn would surely sympathise with unfortunate Madeleine Pulver, who has to recover from her neck-bomb trauma in a hurry to get back to school for the HSC Trial Examinations….in August !!! The previous Treehorn Express didn’t quite work out well. I tried to attach a printed document that was too much to handle. Herewith I submit a substitute comment made about Assessment, Evaluation, Testing etc. way back when bushrangers were a nuisance [some think]; and younger teachers had yet to learn how to scare the daylights out of kids with tests, tests, tests. It is difficult to imagine why a teacher would want to give a test of achievement to a whole class and assign some sort of rating. I know that many do it, as I did before I came to grips with the full nature of learning in the classroom; and I also thought that it was expected of me. Even the most thoroughly class-wide prepared tests, whether constructed by a professional test writer or expert diagnostician or thoughtful teacher cannot provide much assistance to aid children’s progress. Such tests are given in circumstances that are well apart from the learning experience, have little feed-back value and their only purpose seems to be the allocation of a score or mark for easy-to-test aspects of human behaviour. Yet, some of us have been perpetuating such achievement-busters and shrouded the noxious influence that they have on pupil progress by using flash descriptors like ‘assessment’, ‘performance indicators’, ‘evaluation’ and more. To make things worse, we invented some mystical ways of reporting to parents which, oft times left them confused, angry or disappointed in their children. It was cruel, although some parents, especially those of brighter pupils liked percentages and class placement. The outcomes were bad enough, so we used letters of the alphabet or some other fuzzy indicators that were just as inappropriate as a ‘mark’ aka ‘grade’. Everybody knows that a reliable measurement of almost any human activity would show that half of the cohort performs at less than average whether it was bowling a cricket ball at a stump, kicking a football through some posts, lobbing a goolie in a spittoon or doing a mathematics test. A bell-shaped curve can be drawn about accomplishments in almost any human activity. However, we managed to persuade parents that nearly everybody is above average. That’s no mean feat. Some of us gave tests [I did. Hands up!] and announced the results in public or semi-public arenas in the name of ‘healthy competition’. We violated the sensitivities of children and defied the conventions of confidentiality. Society, we opined, was intensely competitive and we needed to teach kids how to handle it from as young an age as possible. If this argument was valid, we should have combined other elements of a competitive society – lying, cheating, conning, bad-mouthing and the normal subtleties of a structured free-enterprise system. On second thoughts, we actually encouraged such talents as part of the hidden curriculum, without meaning to do so. One would hope that things might have changed over the past few decades. Hopefully, we are now able to teach children how to evaluate their own progress in a positive developmental way. For us to assign a mark or grade or judgement to another’s academic performance without sharing the detail is surely immoral. Well, it is not very nice, anyhow. Real teachers don’t do things like that. Pretend teachers may, to satisfy some unfeeling superior being [as Eichmann did] or to waste good time. Those who work full bore with a class group for a full teaching day over an extended period of time don’t need to do this, surely. For those who persist in testing, appraising, assessing or evaluating or whatever semantic mix we use, we can only hope that they get it right and use the terms properly. It is about time that we sorted out the meanings and pondered over the practices to which they refer. With a positive, cheerful attitude we need to ask ourselves why we do what we do, and consider the possible consequences of our actions. EVALUATION Evaluation is a personal process that helps us to do better. It is a legitimate, useful thing to encourage in schools. It exists. It’s the biggest and most important subject in the curriculum. It is continuous, inlaid into every topic and subject. It is about building a desire to improve ourselves as we learn and has nothing to do with threatening people, comparing results or classifying people. It is part and parcel of the learning enterprise. Ask sportspeople and artists about the skills that they require. They will break them up into components and tell you about how they are trying to work on the more important bits. I don’t know of any great sports person who does not share personal evaluation with a coach/teacher or professional/ teacher whom they trust, no matter how good they are. Evaluation is a careful judgement that we make, in some way or other, about our own performance. A teacher is a person who can share achievements with us and guide us along the way. Teachers know that, in the learning process, feelings and beliefs are more important that scores. Their efforts are directed at helping children to feel more confident about what they do. TESTING Testing is a careful examination of what we are doing so that we can gain on overall view of our performance. It is part of our evaluation processes. There is a natural need to test ourselves on our performances and to try things out so that we can improve. It forms part of our ongoing appraisal of how we are going. There are millions of testing devices. The worst are paper-and-pencil responses to concocted questions from some distant non-schoolie. The need for testing is personal, applied at the crucial moment. We can measures our progress in many ways and only a few parts of a school curriculum can lend themselves to a quantitative score of some sort. Sometimes the teacher ‘needs to know’ on a whole-class basis. The teacher needs some information at that point in time and the pupil supports the notion because it helps. It’s a classroom device that needs to be performed sparingly for it is more likely to have a deleterious effect than a supportive. APPRAISAL There are points along the learning track where we think, quite seriously, about our progress. We judge the quality of our efforts on a largish canvas. Such appraisal does not need to have a scoring function, It is a subjective judgment of quality. Perhaps some sort of test might help us to make such judgments and our teacher will have advice to offer and provide access to various devices. It is the sort of thing one does when school progress and personal future is discussed with one’s parents and/or other important adult. It is a generalised thing containing important detail. Such appraisal will help us to make some serious decisions – whether to continue with feelings of confidence or with doggedness or with feelings of inadequacy that might need some repair. It is different from an ASSESSMENT and of much greater importance. Assessments are used by real estate agents, insurance companies and used-car salesmen. They fix a score or a value; and the learning process is too complicated and too lively to nail any part of it to the wall. In the school context, when the assessment function does all of the above and assigns marks or grades or scores at each part of the process, like pure testing, it is dangerous. I conclude with the distribution of a list of quotations assembled by evaluation guru, David Ham, whose own comment I have moved to the top of the list to honour his effort. Take them home and nail them to your office wall………. What are Naplan & National Standards & National Testing & NCLB? Treehorn was an ordinary school child who had an extra-ordinary experience; he kept shrinking until he was so small that he could walk upright under his bed. He kept doing the ordinary every-day things, while trying to get important adults to notice his problem. Nobody did. Adults just don’t care much about ordinary children of primary school age. Florence Parry Heide, in The Shrinking of Treehorn, supported by bizarre illustrations by Edward Gorey, brings this clearly to our attention. It means that, when children, like Treehorn and his friends, are institutionalised, other adults [politicians, measurers etc.] can do what they wish with them. Treehorn wishes, this week, that he was a boat-boy or a baby whale. Someone would notice him. SO…The things that ordinary adults endorse, by their disinterest and silence as well as their compliant quiescence, can be demonising for the future of the present-day generation of school children. Believe it. This applies especially to adults in those western countries where governments have introduced forms of blanket testing to schools that clearly destroy important aspects of learning. These western countries pretending to know better than others, become ‘hoist with their own petard’ and allow blanket testing to control their systems system. Blanket testing curbs and destroys the democratic function of a useful curriculum [aka ‘a guide to the learning of items of interest’] whether such testing is used at class-room level or at national year level. Every trained, professional, child-oriented teacher knows that. Once upon a time, we believed in schooling as a useful way of helping children to learn as much as they could, because they wanted to do so. Children like learning. Since children value what they do, teachers once included evaluation as part of the learning experience. We believed, then, that the interaction between a teacher and a pupil was an important contract that should not be contaminated by nasty interferences. We’d been there, done that cruel testing business earlier in our history; and had learned our lesson. We had learned that self-generated personal testing is integral to the learning processes and deserved to be expanded. We used to talk about it. Not enough, of course. Attached to this Express is a paper that was sent to every teacher in Queensland at a time when Evaluation, Assessment, Appraisal etc. were topics of conversation and became important Conference titles for learned societies and professional groups. 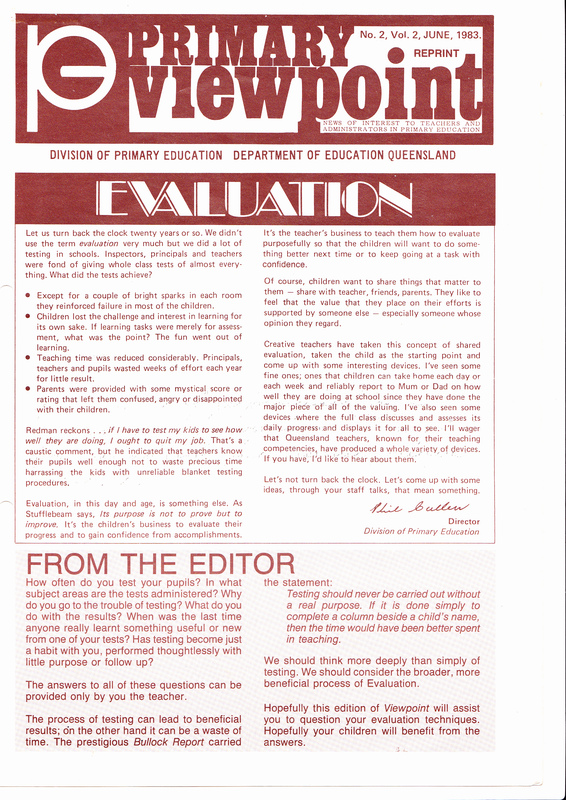 In the hope that teachers would talk to each other about the evaluation of pupil effort, Jim Gray and David Ham as co- authors of what was called Primary Viewpoint, sent the attached article to every primary teacher in the state. This particular topic was so popular that it was repeated on request. See the heading and note the year. Only the first two pages are attached. The remaining two will be sent next time. Sorry. Allan of Hokowhitu School, New Zealand speaks of the situation in New Zealand in Bruce Hammonds Leading & Learning. Please don’t lose heart, Allan. The world’s children need Principals like you. In an article called ‘On the Shoulders of Giants”, he worries that things might be in limbo. I’d recommend his article and the references that one can click. What children are saying to us – which we adults more-often-than-not ignore. * I am different. I am different from every one else in the whole wide world. * From time to time, I need something special from those around me. My needs differ. * My interests change, although sometimes they match those of my friends. * When I do something I notice that I am sometimes better at the task than others; sometimes not as good. * On many occasions I have a different attitude to things than do others. * Some fellow pupils concentrate on tasks for longer than I do. Some cannot concentrate as long as I can. * My upbringing has been different from others. It might seem similar to you, but all sorts of things have happened to me up until now. Please don’t try to clone my learning instincts or brand me with scores and numbers. I’m an individual. I’ll go with the flow; but….fair go! * I am always curious. I like to explore and think and talk about things, if I am not threatened. * If something attracts my attention. I will explore it without any assistance from anyone else; but I often need a lot of help. * If you want to attract my attention you’ll need to persuade me that I should take an interest. There is no way in the world that I will learn from anyone if I don’t want to learn. Got it? I can’t be forced to learn. I’ll pass your silly tests for you, but I’ll learn what, where and when I learn… at my pace. What more can I tell you about learning ? * The more confidence that I have in my ability, the more that I will want to learn. * I like to manipulate material when I am learning, if it is possible. Reality stuff. * I love to play. I really love it when my teacher uses play as part of a learning endeavour..
* I can be persuaded to learn almost anything if it is hands-on fun. However, I decide what I will learn. I chose. Teacher, you set it up. * I appreciate the opinion of my teacher, mum, dad, friend to see what they think of my progress. If I have to go to the trouble of doing something important, I want it evaluated seriously by one or all of them; but it’s nobody else’s business….ever…..nobody. * I don’t like being told what I must learn. I have to be interested in the first place and, in a way, give my approval. * I don’t mind doing drill stuff if there is some fun attached to it. I can even dance to the three-times-table. * I hate sitting in the same place for too long, unless what I am doing interests me. * I can only listen to a speaker for a short time [5 minutes max], unless what is said interests me. A few minutes, without being involved, is more than enough. That chalk-talk stuff can be a real bore. Gosh. You know this. How come, Mum and Dad and Teacher, you allowed them spoil it all with those sit-down,shut-up, do-as-your-told silly tests? What do I do at school to help me learn ? Well, amongst other things I do most of the following during the day to help me develop my learning techniques. I’m busy. Why worry me more with that blanket-testing, time-wasting junk? Please share this message with as many people as possible. Give Treehorn and other kids a break.